Gastric bypass, also known as the Roux-en-Y, is a combination procedure that uses the restrictive and malabsorptive elements of weight loss surgery. 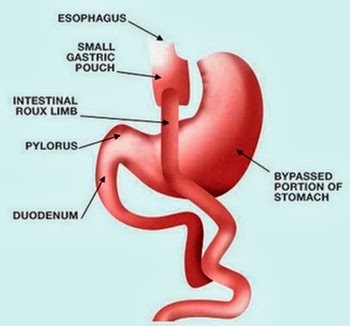 Gastric bypass involves stapling the stomach to make a smaller pouch. Then, most of the stomach and part of the intestines are bypassed by attaching, usually by stapling, a part of the small intestine to the smaller stomach pouch. The result is that patients cannot eat as much as they could prior to the surgery, and their bodies absorb fewer nutrients and calories. Gastric bypass is the most common weight loss surgery being performed in the United States and is regarded as the Gold Standard in obesity weight loss surgery. At Surgical Healing Arts Center, this procedure can be performed laparoscopically, which is a minimally invasive technique, or via the traditional “open” procedure. Some significant advantages of a laparoscopic procedure include smaller incisions, a faster recovery time and less risk of incisional hernias. The majority of patients are likely to undergo the laparoscopic approach. However, it is important to note that not all patients will be candidates for the minimally invasive approach. Your surgeon will help you to determine your best option. How Does Gastric Bypass Treat Obesity? Using the laparoscopic approach, your surgeon will make several small, one- to two-inch incisions on your outer abdominal cavity and insert small ports into the incisions. Special laparoscopic instruments will then be inserted through the ports to perform the procedure. First, the surgeon will insert a small video camera into the patient’s inner abdominal cavity, enabling the surgeon to view the cavity on a video monitor. Then, the surgeon will create a small pouch—about the size of a hardboiled egg—at the top of the patient’s stomach. Then, a small part of the small intestine is attached to this upper pouch of the stomach. This allows food to enter the small intestine for absorption and bypass the remainder of the stomach and first part of the small intestine. The smaller stomach pouch limits or restricts the amount of food that the patient can consume. The smaller amount of food also bypasses a good portion of the small intestine, creating a mild malabsorption. In other words, the food skips over part of the small intestine during the digestive process, causing your body to absorb less calories and nutrients than it would have prior to the surgery. The smaller stomach pouch and shorter digestive time often lead to successful weight loss in more than 90 percent of patients. The remaining portion of the stomach, called the “gastric remnant,” will no longer store any food, but it continues to produce gastric juices. There is no reason to remove it. The gastric bypass procedure can successfully put patients on the road to recovery from clinically severe obesity. However, surgery alone will not ensure long-term success. Surgery is merely a tool that is used to help patients do the work. To reach a healthy weight, patients much adjust their eating habits and exercise patterns. Most patients lose nearly half of their excess weight in the first year following the surgery and continue to lose weight after this point. There is no guaranteed amount of weight loss. Weight control is the personal responsibility of the gastric bypass patient. Habits that contribute to successful weight loss include eating three small, well-balanced meals and no more than one snack each day. Patients should avoid carbonated, caffeinated or sugary beverages, as well as alcohol. Patients tend to regain weight if they begin eating larger portions, grazing or snacking between meals, consuming high fat or “junk” foods or drinking high-calorie beverages. A regular exercise program is very important for promoting and maintaining weight loss. Studies have shown that patients who exercise for 45 minutes at least three times per week lose an average of 18 percent more excess weight than patients who do not exercise regularly. More than 50 percent of patients achieve good to excellent weight loss results following gastric bypass surgery. Expected weight loss is 55 to 75 percent of the patient’s excess weight. It has been proven that patients who participate in an extensive after-care program following gastric bypass surgery lose more weight. However, this success depends entirely on whether the patient follows a very restricted diet for the rest of his or her life and makes major lifestyle changes. Risks and complications, including death, are associated with all major surgical procedures. Severe obesity increases the risks of some complications. All major abdominal surgeries carry a certain risk for pneumonia. However, this risk is increased during gastric bypass surgery due to the additional stress the patient’s excess weight places on the abdominal wall and chest cavity. The team at Surgical Healing Arts will teach the patient breathing exercises before and after surgery to help reduce the risk of developing pneumonia. These exercises include deep breathing, sitting up, standing and walking the same day of your surgery. Another potential risk is venous thrombosis, or blood clots in the leg. In very rare instances, a piece of the blood clot may break off and travel from the veins in the legs to the heart and lungs. This event, called a pulmonary embolism, can be very serious. Our team uses strict measures to help prevent a pulmonary embolism by immediately exercising the patient’s leg muscles to promote blood flow. Walking immediately after surgery is a vital component of these measures. The attending nurse will make certain that you are out of bed and walking within four hours after the surgery. You will also wear leg wraps, or sequential compression devices, while recovering in bed. These leg wraps will automatically compress your calf muscles to promote blood flow. If possible, you will also receive a daily injection of blood thinners during your brief hospital stay to further minimize the potential development of blood clots. Incision infections occur in about five percent of patients who have undergone weight loss surgery. One likely contributing factor is that most patients seeking weight loss surgery have diabetes and are prone to wound infections. The team at the Surgical Healing Arts will closely monitor each patient to ensure that any signs of infection are treated promptly. Gastrointestinal connections, such as the one made during gastric bypass surgery, always have a risk of leaking. The surgeon will perform various tests to determine that the new gastric bypass is securely intact. A leak can be very serious and could require further testing or emergency surgery. According to reports, five percent of patients who have undergone gastric bypass surgery have developed an ulcer at the site where the small intestine is attached to the upper part of the stomach pouch. The ulcer could lead to abdominal pain, persistent nausea or bleeding. This complication can usually be controlled through medications. In rare instances, another surgery may be required. A small percentage of patients may develop narrowing, or “stricture,” of the opening between the new gastric pouch and the small intestine. If narrowing occurs, an outpatient procedure involving mild sedation is routinely used to widen the opening. Multiple treatments may be required, and in some rare cases, additional surgery may be needed to correct this complication. More common but no less serious side effects include vitamin, mineral and protein deficiencies. Deficiencies of calcium, iron (needed to make red blood cells), vitamin B12 (needed to make white blood cells and help the nervous system), and protein (for healing and muscle building) are well known issues associated with gastric bypass surgery. Therefore, all patients will require life-long vitamin, calcium, iron, vitamin B12 and protein supplements. Patients will be required to have frequent visits with their surgeon or physician to help prevent any nutritional deficiencies. Nearly all of these changes should resolve with time. Bariatric surgeries have many types. All of these are geared towards altering the digestive system make up of each person to aid them in their much needed weight loss. Only the morbidly obese people can undergo Bariatric surgical procedures. Morbid obesity is defined as an excessive overweight condition which entails that one weighs a hundred pounds or more than their normal body weight. Let us learn more about the different Bariatric surgical procedures to broaden our knowledge about this medical weight loss treatment. o Predominantly Malabsorptive Procedures - these operations reduce the stomach size but their main purpose is to create malabsorption inside the body. This complex operation is also known as Scopinaro procedure. This kind of Bariatric surgery is now rare because of the problems in malnourishment observed in some the patients who have undergone this procedure. A part of the stomach is resected, creating a smaller stomach pouch. The distal part of the small intestine is then connected to the pouch, bypassing the duodenum and jejunum. This is the main reason for the severe malabsorption of nutrients resulting in nutritional deficiency. Patients who have undergone this procedure must have the need for additional vitamin and mineral supplements intake, even exceeding the normal dosage to keep up with the malnourishment they experience. This operation is performed by dividing the proximal jejunum and then connecting the top end of the jejunum into the ileum which is located further down the small intestine. The food taken in by the patient does not pass through all the absorptive areas of the jejunum making them very susceptible to malnourishment and even liver failure because of lack of proper nourishment. This is just a few of the reasons why this procedure is no longer performed. o Predominantly Restrictive Procedures - these procedures mainly concerns reducing the size of the stomach. This procedure is also known as the Mason procedure or stomach stapling. The procedure involves permanently stapling a part of the stomach to create a smaller pre-stomach pouch. This will serve as the new stomach. Dr. Jim Greene would like to invite you to learn more about various Bariatric surgery procedures. Find all of the information you need in order to make a sound decision regarding weight loss surgery. The short term benefits are what many people are most familiar with when they think of weight loss surgeries. These include the immediate drop in weight and the overall improvement of the general health of the patient. What some may not be aware of is that these health benefits are often reported for years after the surgery has taken place. In many patients who have their six-year follow up visit, the majority of them has lost at least 20 percent of their pre-surgery weight and has successfully kept it off. In addition to keeping the weight off, they also show drastic improvements in their blood pressure levels as well as their diabetes. Bariatric surgery is most commonly suggested for patients who have a body mass index of at least 40. The number drops down to 35 if they are experiencing health problems such as diabetes or high blood pressure. In addition to the patient's body mass index, they must also present with other weight related health problems to be considered for this type of procedure. There is also an additional list of criteria that potential patients must meet before they are referred to a surgeon to discuss the different types of bariatric surgeries they may choose from. The most common of these surgeries is the gastric bypass. This surgery involves a surgeon shrinking the patient's stomach my making the upper portion of the stomach approximately the size of a walnut and then connecting that area directly to the small intestine. Some of the most common weight related health problems that can be alleviated by undergoing bariatric surgery include high blood pressure, high cholesterol, heart disease, diabetes, sleep apnea, infertility and respiratory insufficiency. Each of these health problems can be dangerous enough on their own, but when a patient exhibits multiples of these health problems they are in dire need off making lifestyle changes. Bariatric surgery can help reduce the patient's existing high blood pressure and diabetes. It can also help improve the other conditions as well; this is why so many patients may choose to have bariatric surgery. As with any type of surgical procedure there are always risks involved. If you are concerned about the risks associated with bariatric surgery, you should consult with your primary caregiver or the surgeon that you may have been referred to. They will answer any questions that you may have about the different types of procedures and the risks that are associated with each. Nina Mehrabani is a Health care Coordinator for One Stop Med Center located in sunny Mexico where high quality care and affordable cosmetic surgery is their priority. To learn more on this topic and other various cosmetic surgery procedures, please visit One Stop Med Center. Teen obesity is increasing dramatically. The number of dangerously overweight teens is increasing drastically, so do the popularity of weight loss surgery among young population. Despite the fact that the cost of weight loss surgery is extremely expensive, and insurance companies do not often cover this procedure, more and more men women and teens who have not been able to maintain weight loss through dieting alone are now looking to get rid of their excessive body weight through surgery. Today, a variety of surgical options to lose weight are available, with many of them offering best possible results. These procedures include lap band, gastric bypass, gastric sleeve and mini gastric bypass. The Facts for Families data sheet by American Academy of Child and Adolescent Psychiatry (AACAP) shows that the number of obese teens in the United States has grown to epidemic proportions in recent years, with 17 percent (or 12.5 million) of all children and adolescents considered obese. The severely obese teens are at risk for serious medical conditions such as diabetes, heart disease, sleep apnea, and joint problems. The surging teenage obesity rate has contributed to the weight loss surgery trend around the world. Is weight loss surgery right option for teens? Many studies have billed the surgical ways to lose fat in teens as both safe and effective but many doctors still hesitate to recommend surgical intervention for teens. While some experts caution that surgery isn't an option for most teenagers, suggesting that teens can achieve ideal weight with the help of changes in lifestyle and diet as well as physical activity and medical treatments, some others believe these non-surgical techniques do not work effectively in aiding weight reduction in the morbidly obese teenagers. Since several studies have shown some of the benefits of bariatric surgery for morbidly obese adolescents, the weight loss surgery has found acceptance as an effective weight reduction strategy for teen population. However, the surgery is still very rare in this group. A small percentage of teenagers are considering undergoing the surgery to aid them in their battle to lose a significant amount of their extra body fat. For those abnormally overweight teenagers who have just not been able to lose weight with doctor-approved diet and exercise plan alone, there is weight loss surgery to help them in their fight against the dreaded stomach bulge and enhance their lifestyle. However, the teenagers need to be both physically and emotionally mature before undergoing the operation. Like adult obese patients, teens can opt any of the two types of weight loss surgery- Restrictive or combined Restrictive and Malabsorptive procedures. Restrictive form of weight loss surgery is less invasive, limiting the intake of food by shrinking the size of the stomach. This type of surgery makes a patient feel full even after consuming very small amount of food. The restrictive weight loss surgery procedures include the gastric band, the gastric balloon, and the gastric sleeve. The combined restrictive/malabsorptive procedures could be much more complicated weight loss surgery options for teenagers. The operations in this category, including the Roux-en-Y bypass (long limb or distal gastric bypass), reduce a person's food consumption capacity by reducing absorption of nutrients and calories by the digestive system. Although in several studies weight loss surgery procedures proved safe and effective in treating obese teens, still it is vital that the prospective patients are closely evaluated to ensure suitability for the surgical intervention. Family support and a strict dietary regimen for the rest of their lives after the surgery are very important to evade their risk of regaining the weight they lost. For morbidly obese people, Gastric Sleeve in Tijuana, Mexico offers a viable solution. If you're considering replacing your arthritic knee but lack money, the low cost Knee Replacement in Tijuana could be a cost-effective option for you.